The Death of the Market-Oriented Party/Candidate; why Clinton lost. The morning of the ninth of november will forever be seen as a historical morning. On approximately 3AM EST, Donald J. Trump was declared the winner of the 2016 US presidential election while Clinton lost. A couple of weeks before the election it seemed as if the only one still confident of his win was Trump himself. Nearly every poll, including exit polls held on the day of election, resulted in giving Hillary Clinton an approximate 70% chance to win. Venerated polling companies, who make their living providing accurate predictions, were wrong. The likes of Ipsos and YouGov were plain wrong in their predictions. The shock of Trump winning the election will only be surpassed by the shock this will mean in the field of Political Marketing. Prominent political marketing intelligentsia have been predicting a shift towards professionalization of campaigns, and this result has shattered the foundations for their assumptions. What does this mean for the future of political marketing? Adapted from Political Marketing and Professionalized Campaigning (Strömbäck, 2007). Red is Trump, while blue is Clinton. What is ‘Market Orientation’, and why is it bad? Up until the 80’s, most political campaigning was done according to a product-orientation, as pictured above. Political actors designed a product, communicated the product to the people, campaigned for it, and hoped for the best during the election. After the election, they only had to deliver on said product. As technology became better implemented in campaigns, it became easier to induct market intelligence into the political product. This market intelligence was used in order to communicate the political product more effective to the populace. This became known as the sales-oriented party. 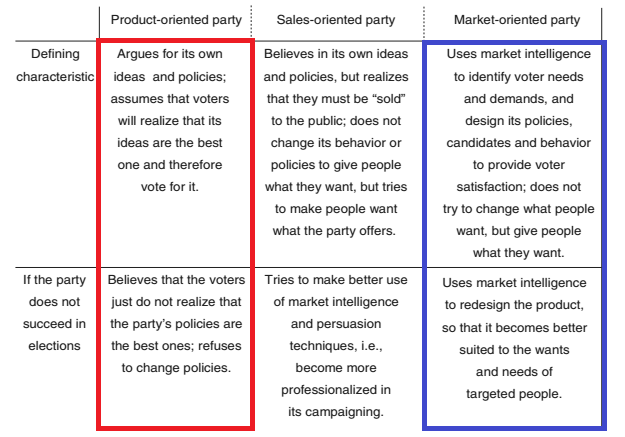 Campaign teams, however, came to rely on market intelligence more and more in order to maximize voting behaviour in their favour. They started using market intelligence in order to create the political product. They further relied on market intelligence in order to adjust the political product, and used intelligence in order to implement it. Instead of creating a good political platform they actually support themselves, they create a platform they think will kick the minimum amount of shins. This might improve electability (to a point), but the general public is often incapable of knowing what is actually good for them. And, in order to appease as many people as possible, the strength of the political product gets tarnished. Flip-flopping on issues is a severe consequence of this, and it takes away from the perceived authenticity of the party or candidate figureheading the campaign. Especially in the age of the internet, with every piece of information being archived and readily available to a bored public of armchair journalists. Many experts in political marketing believe this market orientation, which began to take form under James Carville when he led Bill Clinton’s 1992 presidential campaign, is the way forward. If you want to see how such a campaign is done, this excellent 1993 documentary ‘The War Room‘ (link to full documentary) shows it best. This election result, however, might have shattered this notion. Clinton versus Trump was mainly a battle of authenticity. While Trump remained his true, obnoxious self while tweeting the most vulgar tweets which would make even the most battle-hardened campaign worker resign on the spot thinking he would never get this person elected, Clinton remained calculating. Her problem was that she couldn’t bind the more progressive parts of her supporters to her cause. This started during the democratic primaries, when Senator Bernie Sanders lit the fire under Clinton’s campaign’s asses. While they thought they had the nomination in the bag, suddenly the country found new hope in Bernie Sanders. Instead of believing in her message, she started flip-flopping on issues such as TTIP and Keystone, while she schemed behind the scenes with the DNC in order to win the nomination. Authenticity consists of six main conditions for a political product, as devised by Catherine Needham in 2005 (link to article). The others being simple, something which is easy to digest for the general public; unique, meaning that the candidate sepparates his or herself from the herd; reassuring, in that it reassures people that a vote for them is the best thing for the people; aspirational, giving people something to look forward to; value-based, just show your are an emphatic human being; and credible, the message should be believable. Now how many of these boxes does Clinton tick, and how many of them does Trump tick? While Trump, with the exception of his comb-over, ticks almost all of these conditions, it is hard to argue Clinton ticking even one of these boxes. She was perceived as dry, incapable of delivering simple messages, as a career politician (and thus not unique), she was only reassuring and aspirational in that a vote for her would directly counter Trump, was often called a robot due to a lack of (authentic) emotions, and most of all, her flip-flopping and scheming meant that her political product lost credibility to a lot of former Bernie supporters. A market orientation is dedicated to doing and saying anything to get elected. It worked for Obama, but it did not for Clinton due to the reasons above. Some would argue that it is because Clinton is a woman. If you see or hear anyone saying that, please slap that person for me. It was because Obama had the charisma to be perceived authentic, while Clinton did not. Obama had such charm, he could tell you the worst flat-out lie and you’d want it to be true. Saying that Clinton didn’t win because she is a woman, is like saying that women lack charisma. True, being a woman might not have helped her cause, but if a black man can become president, so can a woman. No, it is not because of women. It is because of this particular woman, and a campaign that was doomed from the beginning due to her lack of creating a relationship with the electorate based on trust. People need genuine authenticity, driving them into the hands of product-oriented populists like Trump and Sanders. They won’t tolerate another over-promising, under-delivering president, whose campaign promises were mere fabrications to sound good on the ballot. In my opinion, a market orientation only works in favor of populists. Instead of creating a strong political product and selling it to the people, they provided a half-assed platform based on various calculations which should have netted the biggest chance of getting Hillary Clinton elected. People felt they were being lied to, and were subsequently turned off from voting for Hillary. You can only fight right-wing populism with a strong left-wing platform, and Bernie Sanders had such a platform. His problem was delivery, and, paradoxically, a lack of professionalized campaigning. Sanders was, like Trump, a populist. True, his populism wasn’t xenophobic rambling of a high-energy madman, but one of social values. He was a true social democrat, in a nation that despises anything that even smells like socialism. Sanders would have benefitted from a more sales-oriented approach. While he did gain a lot of ground during the primaries on Clinton, the battle, by then, had already been mostly lost. If Sanders had a better, more concise method of delivering his points to those who are perhaps more moderate at the start of the campaign, we would probably have had President Bernie Sanders, and we would be patting ourselves on the back for dodging a Trump-sized bullet. Using market intelligence for the campaign is not bad. But the way it is implemented, the way it is relied on nowadays, have lost Clinton the election. PS: as promised; the embedded assignment I wrote over half a year ago. We had been warned… by THIS guy. So we should only elect dictators in the future as long as they agree with us right? No longer should the president be a public servant who fears the people but a leader who will wip the masses into submission. I disagree with this article and am disappointed after reading your last article. Please Google: Gallup Poll: Most Admired Woman in the World and see who won 15 years in a row. Charisma is a very male attribute and also, while I think Obama is the best president of my lifetime, the specture of slavery has hung over this country and I feel for many voting for Obama was a way to right that wrong. A lot of people don’t feel the same about feminist causes. Many people see women as overprivileged. It’s hard to get around that mindset. Hillary didn’t lose, she won by 3 million votes. She won more votes than any other man has ever won in a US election except for Barrack Obama. She lost to our archaic electoral system that favors rural people over urban people. And she lost to rural people because as a woman running for a left wing party, she wasn’t sufficiently non-threatening. You are Dutch, and right now you’re country is going through a right wing resurgence coinciding with your country going from a fairly homogeneous nation to a multicultural one. And sine our electoral system favors the homogeneous rural center, I do agree that Bernie Sanders was probably a better candidate than Hillary for the system we have, but in this cycle, he might still have lost. 8 years of a black president was just too much for much of white America to handle. A president who wrote erotica and advocates raising taxes and making the safety net even bigger would have been a hard sell. His popularity wold have dipped. The media liked him as a David to Hillary’s Goliath. That was the narrative. Had he won the nomination the new narrative would have been ‘two extreme candidates, where is the middle?” instead of “two unpopular candidates.” The media was never going to give anyone a pass. But the next cycle the pendulum is due to swing violently back in the other direction. If the Bush era brought us our first black president. The Trump era will probably bring us to someone like Tammy Duckworth. Sanders would be a good president for a homogeneous society where it is harder to scare people with the specter of socialism if all the poor people are the same race as the rich people. It doesn’t work in multicultural societies however. Sanders is a relic of the past. His state is so white and so liberal because like Scandinavian countries, it’s hard to demonize the safety net if everyone on assistance looks like they could be a member of your family. It’s easy to demonize the safety net if the person on government assistance looks foreign. You still need a moderate even when the pendulum is swinging in your favor.